Crimes and other incidents motivated by hatred and intolerance are everyday realities in Armenian society. In recent years, PINK Armenia has recorded numerous complaints concerning crimes and other violations motivated by a person’s real or perceived sexual orientation and/or gender identity. While it is clear that hate crimes are dangerous not only as violations of citizens’ equality and because of the impact on the victim, they are also dangerous due to the impact on the victim’s community, and in regards to issues of state security. The latter, in turn, not only affects the function of all of society, but also undermines the prospect of democratic development and human rights principles. Public Information and Need of Knowledge (PINK Armenia) NGO has initiated this publication with the aim of revealing the overall picture of hate crimes against LGBT people, and to raise awareness about instances of violence motivated by hatred against LGBT people among the legislative, executive and judicial bodies of the Republic of Armenia (RA), as well as among the wider public. The publication describes the forms and characteristics of these crimes, and discusses the importance of access to effective legal protection mechanisms. This report is a message about the possible criminal consequences discrimination and intolerance can have on the security of members of society and the state. 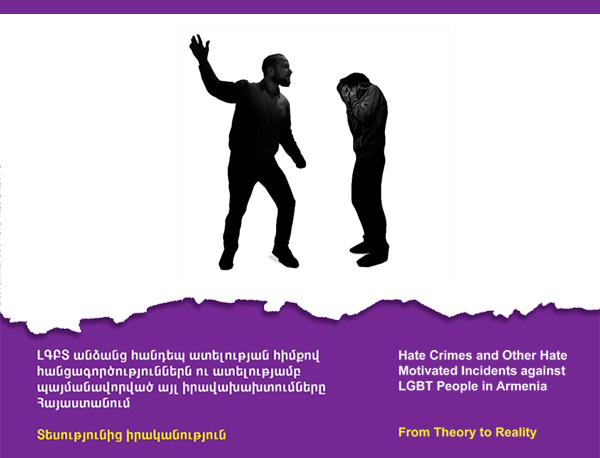 We hope that this publication will become one of the cornerstones and guidelines for prevention, proper investigation and responsibility for hate crimes and other anti-LGBT violence in Armenia.